Alternate title: “The Incredibly Strange Country, Western, and Rockabilly Film Show“. Over three hours of great music from 1927 to 1964, from the justly famous (Bob Wills, Spike Jones) to the unjustly forgotten (Hank Fort, Smoky Rogers, the Korn Kobblers), and many, many others. See notes at bottom. It all started with a Soundie called “The Martins and the Coys” by a group called the Jesters. It is the tale of a hillbilly feud, modeled on the Hatfields and McCoys. Because of its ribald phallic symbol gag ending, I had used it in Stag Party Special. 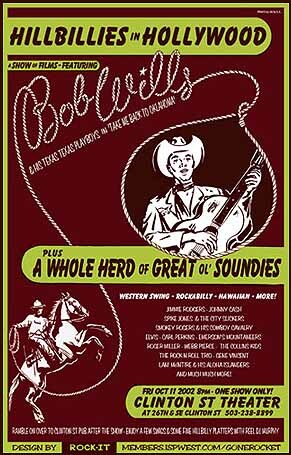 The germination continued when I acquired the feature film “Take Me Back to Oklahoma” featuring the great western swing band Bob Wills and His Texas Playboys. I paired that feature with a bunch of cowboy Soundies to create a program called Cowboy Music Night. I premiered that program at the Clinton Street Theater in 1999. Around fourteen people showed up. In 2003 I was talking to a guy who worked around the corner from the theater. I mentioned my cowboy Soundies and he wanted to see them badly enough to promote another show. His name was Brian Murphy and he had a business he called Rock-it Entertainment. He knew I also had a bunch of hillbilly Soundies so he suggested calling the show Hillbillies in Hollywood. He wanted to know if I could put some rockabilly acts into the show. By the time the big night came around I had assembled over three hours of material. Thanks to Brian a huge sell out crowd showed up. They whooped and hollered through the night that lasted four hours with an intermission. Experience Music Project (aka Jimi Hendrix Museum) in Seattle arranged for the show. They requested that I keep it under three hours. I dropped the feature and included everything else. A very nice crowd showed up. I was then contacted by the Northwest Film Center in Portland. They wanted it under two hours. I did some fine tuning and got it close to that. Another nice crowd appeared. I then decided to take the show to Europe. Since I would be carrying the program around in a back pack, I cut it to 90 minutes. I got a dozen bookings for the show in Europe. There it showed to big and small crowds, both comprised of many mystified people. If people in Europe were mystified by hillbillies, think how the show would go over in Korea! The Seventh Annual Puchon International Fantastic Film Festival booked the show, along with Open Road Show and Blaxploitation Cartoon Special, All three were billed as “Vintage American Slices of Myth and Reality“. I also did shows in Japan. All in all Hillbillies appeared in several far flung corners of the world during the year 2003. The ending of The Martins and Coys always got a big laugh.